After being leaked by both the Korean and North American rating boards, Konami has officially announced Castlevania Requiem, exclusively for PS4. 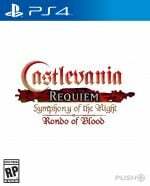 The package brings the PlayStation classic Castlevania: Symphony of the Night, as well as the lesser known Castlevania: Rondo of Blood, to Sony's current gen platform. You can see them both in action in the shortest announcement trailer in history, embedded above. Both games have been upscaled to run at 1080p - or 4K if you have a PS4 Pro - and will feature various rendering filters such as smoothing. Full trophy support has been added too, including what will likely be a tough Platinum. It seems that the games will play out in their original aspect ratio, so you'll have access to numerous backgrounds to frame the action. Castlevania Requiem hits PS4 on 26th October - just in time for Halloween - for $19.99. Will you be picking up these classics, perhaps for the first time? Don't go too batty in the comments below. "You can see them both in action in the shortest announcement trailer in history, embedded above." Wow it was really that short. While neat I would have liked to have seen a more comprehensive collection similar to the Mega Man ones. @quintumply I think you meant aspect ratio not resolution in the penultimate paragraph. Anyway SOTN is amazing so I'll be getting this straight away provided it's not stupidly priced. @LaNooch1978 You're totally right. Fixed! Is this getting a retail release? I’ll probably pick this up at some point, but I’ve only just beat the Dracula X Chronicles on vita. Wish this came out 3 months ago. Just added in the price - $19.99. It's a fair price,no doubt. There is another game releasing on that day that will probably get more attention and day one sales. Probably. Would sell better on Switch and high sales numbers would be a good signal for the developers to keep on bringing sweet Castlevania stuff to PS4. But oh well... Day One also for me. I was pretty excited until i saw it's the same tiny 4:3 window with a widescreen backdrop. Thought they actually managed to widen the view while preserving reasonable pixel size. I guess it's not possible without a new engine. Perhaps we could have them free with Plus? 2 excellent games, especially Rondo of Blood. Hopefully there is a filter free graphics option because I can't stand smoothing. Oooooh! Interest piqued. And that price... my golly. Not sure how two old games constitutes, "an all-new console experience," but I'm down to play SotN again regardless. @Lando Port begging already? People don’t appreciate this stuff. I bought Symphony of the Night with some Christmas money the day after Christmas in 1998. Was the best $20 I ever spent on a game. @adf86 Same here. At least I finally will have a convenient way to play the original Rondo. I was almost about to look at emulating the PSP remake just so I could play the original because I was having a hard time finding either the PC Engine one or the Windows port I heard about. @Lando I know how people here feel about mentioning Switch ports, but yeah I agree. I prefer these retro games on a format I can take with me. Sadly probably won't be day one for me, as I will be SWAMPED with games, including RDR2. I'm definitely getting this at some point though, unless they botch the emulation. Two of my favorite CV games in one package is pretty sweet. I do wish they could have included the remade version from the PSP but hey, this is good too. Only way this could get any better is if they announced CV3 with it, but I don't think I could actually handle that. @PS_Nation : i agree it would be lovely on Switch. In fact, i enjoyed/will enjoy playing them on my Vita. 2D metroivanias feel more at home on a portable, for me. Surprised it's exclusive and not on Switch given how well, sales wise, that Bloodstained game performed. Still SOTN is a great game and never played Rondo so would like to pick this up at some point, when depends on if my kids are hogging the PS4 when it releases which is very likely given the upcoming release schedule! I had the japanese SOTN on import way back when on PS1 and it came with a booklet of gorgeous illustrations. Wish I'd kept it now. But man, that feeling when Vita doesn't even get remasters of PORTABLE collections anymore. @Bliquid pretty much ALL open and semi-open worlds of all sizes are more ar home on a portable. You get more time to allocate for various aspects from story and extensive travels to more bite-sized routine like traversing and backtracking, solving puzzles, leisurely lurking around in search of that one last collectible, even doing mini-games and challenges. "Will you start the port begging, please!" @nhSnork 😓 a sad day! If it’s physical I’ll triple dip. I already have SOTN on ps1 and I have dracula X chronicles on psp which includes SOTN. I still have Symphony on PS1, but I might get this to play Rondo since I never played it before. Dang, I know this is a PS4 website, but I was kind of hoping this would come to switch lol. Wait a sec. Aren't those Konami games? Don't we hate Konami or something? I love Castlevania and would have bought them in a heartbeat either on psvita or on ps4, but with better graphics. As they are, they just feel wrong to me. How people complain about non perfect graphics in some AA(A) games and give old or indie games a free pass is still beyond me. Would have preferred it on Switch, but still very cool. Feel like it's not been that long since I last played SotN but never played Rondo so will be tempted just for that! I’d prefer a Switch version. I will most likely buy this, but I'll wait at least a year for a Switch version. I don't need SotN I have enough copies of that, but a translated version of Rondo...... Yes please. @naruball agreed. amazing how quickly people forget that konami is a company that should not be supported. they are creatively bankrupt and will get by for a while by simply re-releasing old games... seems to be a good strategy for them in getting the general public to "forget". Tried it on Xbox One but the controller isn't suited for this type of game to me and the achievements wouldn't unlock. Boooo! Where's the Vita version! I already have the PSP collection (on Vita and physically on PSP), but I want them TROPHIES!!! Dual-wielded Crissaegrims, here I come!!! @FullbringIchigo true, but nes classic came out prior to the switch classic games... but we shall see soon enough. I would've preferred it on the Switch honestly but I suppose I take what I can get. If you pre-order you get this discounted. I made sure to do so. Been a long time since I played Symphony of the Night, can't wait to do so again on PS4. It is one of the best 2D games of all-time. @PS_Nation Nah, I dont like the Switch as much as I love my PS4 and Vita. To be honest, I hate that thing and all the hype around it. But people tend to buy niche titles on Switch like crazy, while PlayStation is becoming more and more a CoD, Fifa and Battlefield machine. Sadly. To give developers a proper sign, that there is enough interest for their games, to keep on creating them, they need to sell well, dont they? That's because a Switch version of such titles would never be wrong. I'd buy it on Vita and PS4 anyway. I'm more of a Sony fan.